Sony Mobile is excited to announce a once in a life time promotion where you get more than you bargained for. 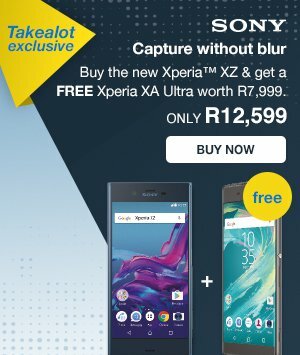 This month if you pre-order and purchase the brand new Xperia XZ with Takealot you will get an Xperia XA Ultra for free. Christmas came early! The Xperia XZ boasts an impressive 23MP main camera which not only gives you clear shots, but also super-fast start-up going from standby to capture in 0.6 seconds at the touch of a dedicated shutter release button, ensuring you are ready to take the perfect shot whenever it might strike. The Xperia XA Ultra is equipped with a large 6” screen, 16MP front camera, low-light sensor, up to two days battery life and a stylish thin design with a border-less screen which makes it a fantastic mid-range smartphone for every need. Purchase an Xperia XZ online for R12,999.00 with Takealot and get an Xperia XA Ultra valued at R7,999.00 for free. Offer valid from 1 October 2016 – 15 October 2016. The deal is only for the first 100 customers to buy the same.